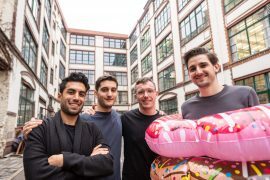 Donut, an investment app for digital assets, has completed a $1.8 million seed round led by early-stage VC Redalpine. Additional funding comes from AngelList’s Philipp Moehring and Andy Chung, N26 Bank board member Marcus Mosen, former N26 CMO Kelly Ford and other angels. EarlyBlock and previous investor Entrepreneur First are also part of the financing round. Donut says the funding will help the company grow its engineering and design teams in addition to further accelerating product development and strengthening strategic partnerships. “We share the vision of the Donut team about the prevalence of digital assets in the future. Digital assets have many beneficial features over traditional assets, yet lack a single access point for holders to conveniently store, manage and transact,” says Harald Nieder, Donut board member and partner at Redalpine. It is seeking to challenge the emerging digital asset market by bringing “convenience, trust and accessibility” to managing and transacting in crypto assets. The firm says its mobile platform leverages PSD2 to do so. The company is built on the premise of making the creation of digital asset portfolio easy and hassle-free, removing the hurdles in navigating private keys, managing wallet addresses and, deciphering complicated white papers. Donut is currently in a beta testing mode with a full launch planned this summer. More than 5,000 users have already joined the company’s waiting list.